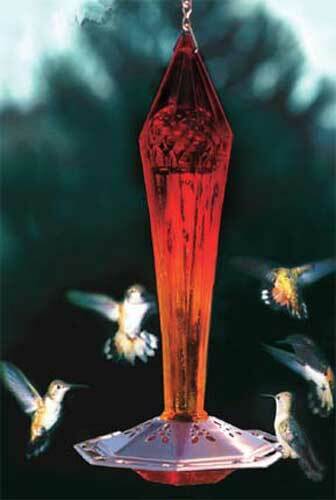 This lovely hummingbird feeder makes an excellent gift and graces any lawn or patio with bird-attracting beauty! 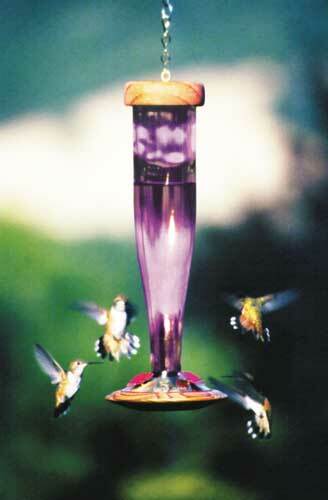 With it's pretty flower shaped drinking stations it is sure to make your hummingbirds hum with joy! Dimensions: 2-1/2 in diamter x 8 in tall. 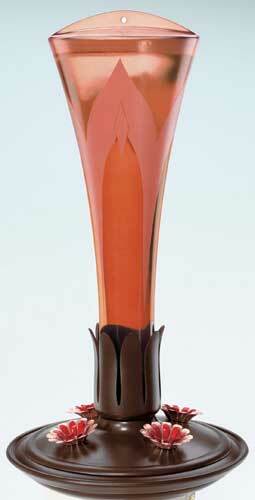 This stunning, art deco hummingbird feeder will have hummingbirds coming to visit in no time! This lovely functional work of art also makes a perfect gift for any bird lover. Durable tempered tinted glass nectar container. Four bee-resistant flower feeding stations. The pineapple has been a symbol of hospitality and welcome in the Americas for centuries; since this tradition began in the Caribbean with the native inhabitants of the Islands. 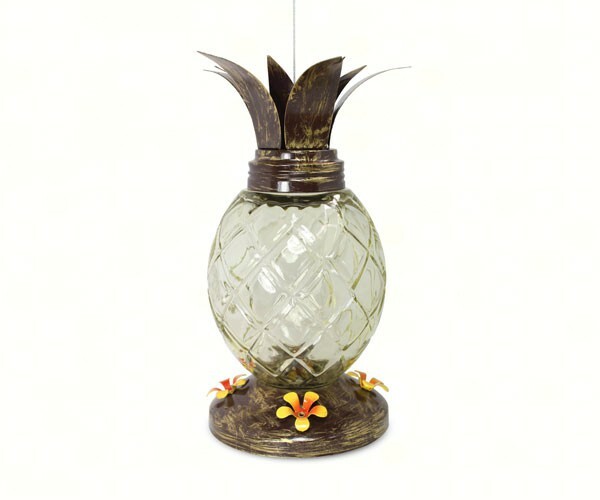 Welcome guests to your garden with this attractive Pineapple shaped Hummingbird Feeder, or give as a housewarming gift! Caution: Hand wash-Do not use an automatic dishwasher. 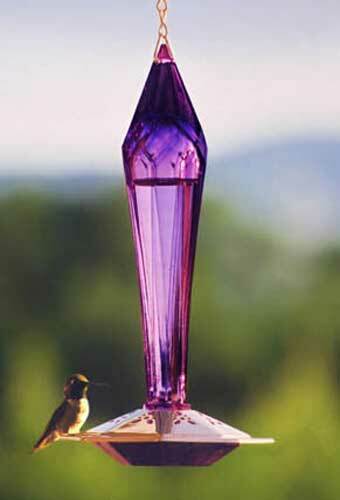 The lovely Violet Meadow Hummingbird Feeder makes a perfect gift and will grace any patio or lawn with it's hand painted beauty. Hand painted glass nectar container. 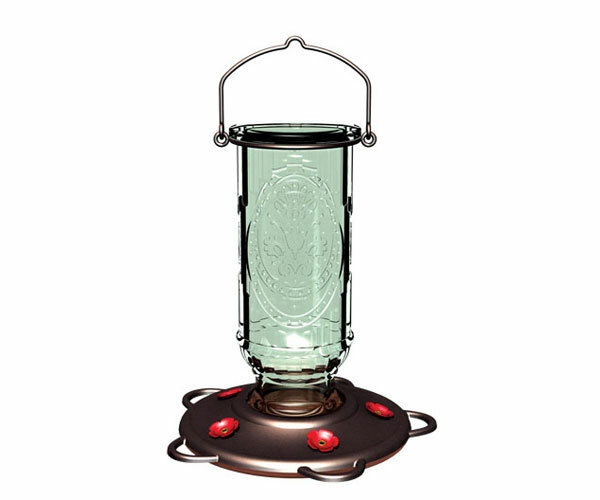 A beautiful glass creation that is sure to catch the eye of hummingbirds & people alike, this fluted, tinted glass nectar container is a beautiful addition to any lawn, garden or patio! 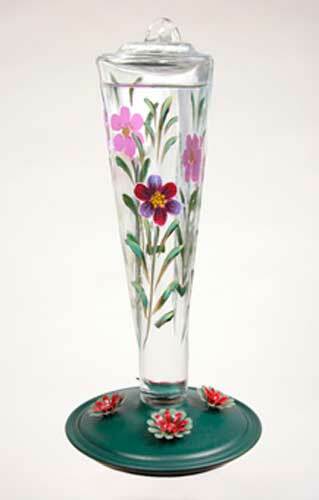 Fluted tinted glass nectar container. Copper base cover with four bee resistant flower feeding stations. Your sure to enjoy this beautiful, durable feeder for years to come! Watch hummingbirds gather around the sunlit glow as it shines through the floral pattern copper base! Amethyst-colored blown glass nectar bottle. Solid copper base with wight openwork feeding ports. Artfully simple, this lovely feeder creates a sleek, contemporary look in any outdoor garden setting with it's kiln-fired glass and irridescent sheen! 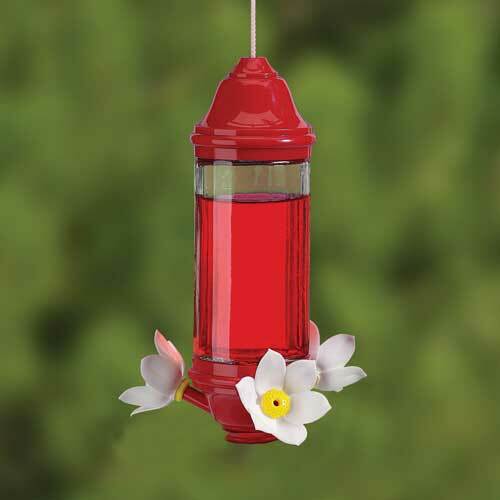 5 highly durable metal perches and beautiful red flowers are integrated into the basin of this classic large capacity hummingbird feeder. The feeder also features a beautiful vintage bottle while the basin features lovely pewter metal accents.